Join Jason, Heather and Mox as they share their experiences in SWTOR. 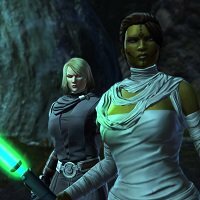 This episode they discuss what they have been up to in SWTOR. Dark vs Light event is going strong. As many are busy leveling new DvL toons, Mox tested out various leveling experiments. Find out what he discovered and how leveling has changed. The hosts also talk about expansion announcement and the five years of SWTOR “look back” video.